1. the exertion of force by means of a lever or an object used in the manner of a lever. 2. FINANCE – the ratio of a company’s loan capital (debt) to the value of its common stock (equity). What I am referring to specifically is the importance of time and how to get the maximum advantage from your time. Time can be negatively leveraged or positively leveraged. An example of the leverage of time is a meeting in the office. 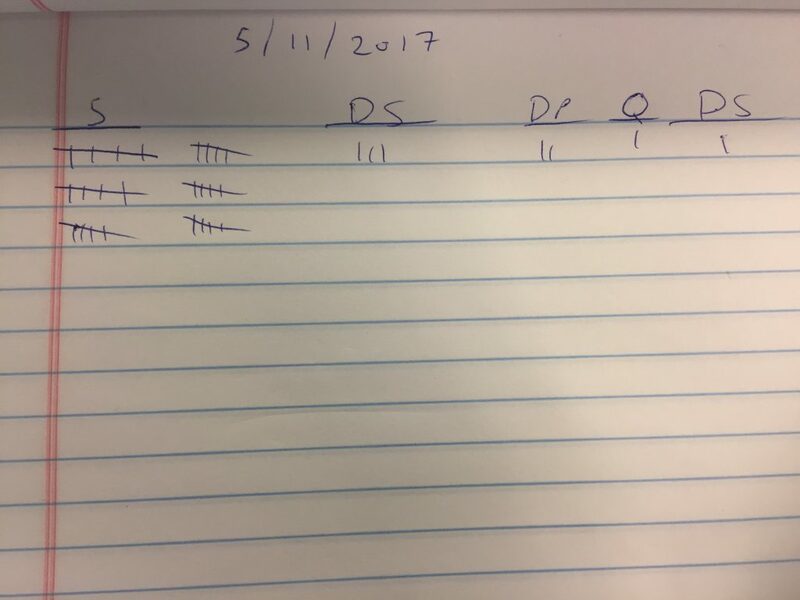 If you call a meeting for a 10 people and have no agenda, no plan, no key results for the meeting, and it becomes something that takes up everyones time and adds no value, this is an example of negative leverage. Now what if you had a meeting that added massive value to the sale team? What if you taught them a new strategy or tactic that dramatically improved the quality of their selling. What if by implementing one strategy at this meeting they were able to increased their sales by 5% or by 10%? What a difference leverage can make! This is the true power of positive and negative leverage. In financial terms, debt is also known as leverage. This can create massive gains if it’s working well and horrible losses when it’s not. The lesson I’ve learned from moving from being a top producing sales person to a leader of a team of top producing sales team is that meetings can be the most powerful leadership leverage you have. As a sales person, I had the belief in the past that many meetings are negative leverage. And then I realized, as a sales leader I now have the power to influence and impact the team in a way that cannot be always be quantified. As a sales leader this is truly one of the most important and powerful discoveries you can make! As a top performing sales person I understood the power of leverage. Now that you understand it, how can you use leverage to increase your sales dramatically? The answer of course is to do more high leverage activities. One of the most high leverage activities I pursued as a sales person was the reading of books, listening to audio tapes, and training programs that would increase my skill levels in key result areas. Again the highest leverage behavior/habit and highest leverage use of time is learning and investing in yourself. This pays huge dividends now and for years to come. Again the highest leverage activity you can take is investing in yourself and becoming the best version of you. If you become the best version of you, how many more people are going to want to buy from you? How many more people are going to love the services you provide if you are performing at your absolute best because of the new techniques and skills you’ve mastered? Now what else can you do that is high leverage? Another high leverage activity that is missed or overlooked by many average sales people is the building of systems and processes and the improvement of systems and processes. if your proposal building process takes you 10 hours per week and you spend 10 hours to build a system that brings this down to 1 hour per week, you’ve significantly leveraged your time now and in the future. The challenge is that most people won’t spend the 10 hours to build the system in the first place and then wonder why their income isn’t taking off. 1) Look at your calendar from last week. What activities are low, medium, and high leverage? 2) What are high leverage activities that you will do more of ? 3) What are the low leverage activities you can eliminate or delegate? The environment you select for yourself is an important factor on your journey to master the art of sales and persuasion. The reason I say this is because your environment influences you, your income, and your career. If you put yourself in a company where sales is not viewed as important or if the someone is leading the sales team and does not see the value in selling (this can happen at smaller start ups) or has a negative view of sales, how happy are you going to be there? If you put yourself in a sales environment where the other people around you are positive and enthusiastic people and you are selling a product you are passionate about and love, and your manager supports your growth, and there is an excellent comp plan and you have the freedom flexibility and autonomy to thrive, how happy will you be there? Now the real question is: how do you know if you’ve selected the right environment ? There are countless opportunities out there. And there is an old saying in programing. Garbage in = Garbage out. If you are out there selling a crappy product with people you don’t respect or admire how are you going to take your sales to the next level? If you want to loose weight should you hang out at McDonalds? If you don’t like where you work you can change it. If you want you can change it. If you don’t like where you live you can change your address. If you don’t like the city you are in you can move. You have to ask yourself the question, is the environment I am in going to produce the income I desire? If you want to make 250k per year and the top rep at your company is only making 70k per year, how likely do you think it is that you will make 250k per year in your current environment? If you want to quit drinking and you keep hanging out at bars and clubs, how likely will you be to follow through? The answer is that environment matters. And Environment affects you. Now would a person who has the identity of top producer, has the beliefs of a top producer, has the capabilities and behaviors of a top producer, would they hang around in an environment that is sub par? Would they hang around where the demands are low, where the motivation is low, and the sales culture is shunned? The answer of course not. One thing I can tell you is that no matter what the environment, if you do less than you can you are doing a disservice to yourself, your self esteem, and your personal brand. The damage can last for years. If you do less than you can, slowly but surely that builds in a habit. The more you reinforce a behavior the more it becomes a habit. And you don’t want to build a habit of doing less than you are capable of. If you have made a decision on an environment, give it 120% of your effort or find a new environment. Well why even try if I hate my job? The answer is another question: how will you attract a new environment with the attitude of doing less than you can? No matter what you should always leave a place better than you found it. If you are working in an environment you don’t like, be the change you want to see. When you do find an amazing environment be aware of the law of familiarity. It’s easy to take things for granted. Make sure you are grateful for the opportunities you have and more will flow your way. Now the real question is how do you find an amazing environment ? Without a vision the people parish. Many people focus on what they don’t want and not on what they actually want. Have you written out exactly what you are looking for in a company? If not, how are you going to know when you find it? I wrote out exactly what I was looking for in 2012 in a company and amazingly enough I looked back in my journal and I found exactly what I was looking for. It’s amazing how easy it is to get what you want if you know what you want and write it down. At the same time I’ve ask people who are on the search for a job, what do you want in a job? And I’ve heard answers like “I don’t know” or “Something that pays the bills” that’s not going to be enough to thrive and excel. To get what you want you have to decide what you want. Spend the time soul searching for what specifically you are looking for in a job, write it down it’s more than worth it! What is leadership? Put simply, leaders demand more from themselves than anyone else would ever expect. They take full ownership, or to borrow from my favorite Navy Seal Jacko, they take extreme ownership of their results and everything they’ve attracted into their life. To become a top performer in sales you must be a leader. You also must respect the leadership of your company. Without strong sales leadership in the environment it will be more challenging to thrive in the sales environment. Especially if the senior leadership in the company does not truly believe in the importance and value of sales. If you don’t have strong sales leadership to look up to in your company you have two options. Option One: Be the leader. Step up and take the lead and demonstrate by example. Option Two: Find another company that has strong leadership. If you are not willing to to do either of these things then it will be much more challenging to thrive in an environment where there is no strong sales leadership. It is also a signal that it may be a bumpy road ahead for the company as a whole. The people you surround yourself with is who you will become. The standards of those around you will influence your standards. The ideal culture is full of star performers who celebrate each others success and are all looking to grow and expand. You can hear the cheers when any deal comes in. And you can feel the excitement on the sales floor. You are lucky to be surrounded by your friends. The contrast is a culture where the people stab each other in the back to increase their own commissions. You can feel your standards being lowered because the majority of the people are doing less then they can, and you don’t hear much on the sales floor not even a peep. You see messy desks and low energy people complaining about how hard sales is. Now here’s a question, do you want to surround yourself with people who are worse than you or people better than you? If you play a game like basket ball or tennis with people who are all worse than you, will you get any better? Strive to find an environment where the standards are high, even beyond your comfort zone, that’s how you grow, that’s how you improve, that’s how you thrive! The industry you select will have a huge impact on your income. If the top performer in your industry brings in 100k per year and you want to make 200k per year, you may be running east looking for a sunset. Select your industry wisely and don’t be afraid to reinvent yourself. One amazing thing about sales is the fundamentals are the fundamentals. If you have a strong working knowledge and completely grasp the fundamentals you can apply them into any industry. In real estate the old saying goes something like this, location, location location. What I have found is that I’m much happier when my commute is short and I work in a beautiful environment. It gives you a certain sense of confidence and the feeling that you’ve made it. Your environment affects the way you think and feel about yourself. I absolutely love working in North Beach in San Francisco on Columbus ave.
You can easily see the Trans America Pyramid and the moon as it’s setting in the early morning and it looks like something from ancient Egypt. You can hear all the sounds of the city as people make their way to work. There is beautiful architecture like the Bay Bridge. You can easily take a walk to Coit tower or to China town and feel like you are in a different country depending on what neighborhood you select. You can smell the wonderful smells of the different restaurants during lunch time as they get ready for the lunch rush. It makes me feel amazing just walking to work and looking at all the beauty! Ask yourself this question, what kind of person works in the workspace I’ve created? What kind of person works at this desk? If you just cringed…. keep this in mind, you can tell a lot about a person by the way they keep their desk. If you were a hiring manager would you want to promote someone who’s desk is constantly a mess and is completely un-organized? If they can’t manage their own desk space how are they going to lead a team? One of the things that massively effected my income was converting to a standing desk. If you are hunched over your desk talking on the phone how certain are you going to sound to your clients? Versus if you are standing and making gestures, how much more powerful do you feel? A standing desk also has a the virtue of curing some of the movement imbalances of working in an office. Once I implemented a standing desk this quickly caught on and now every single desk in my organization has the ability to be standing or sitting. I took a page out of the Gandhi playbook. Be the change you want to see in your workplace. I’ve also been day dreaming recently about a treadmill desk, so we will see what the future has in store for my office environment! What are other ways you can score your workspace to make it more fun? For me music has always been a great tool when working on a project I might consider more boring. Any project you have that you feel is more boring than grass growing can be changed with some simple scoring techniques. What is your vision for your perfect workspace? How would it feel to have an environment that excited you and made you want to get up early and stay up late? What would that environment sound like, what kind of music or cheers would you hear in this ideal environment? Leaders see it as it is and then better than it is. Don’t be afraid to suggest changes or take the first step in your organization, you’d be surprised at the results you can achieve by simply taking the first step. If you are reading this post it’s my firm belief that we share a common bond, the desire to get better at what we do and improve daily. And I expect that if you apply the technique of writing down your specific vision for your ideal career you will achieve what you want if you focus on it single-mindedly until you find it! I once had someone ask me in a job interview: “Dan are you a hunter or a farmer? Top performers in the industry are always on the hunt for more, leads. Not only that they are always farming the existing relationships they have, for more leads. Top performers are both hunters and farmers. Before we get to the different prospecting tactics that I’ve used to become a top performing sales person at multiple companies, I’d first like to mention that prospecting and generating your own leads is not just a strategy it’s a mindset. The easiest person to fool is yourself and I’ve seen countless sales people fool themselves into thinking that they are above prospecting or that prospecting is beneath them. There is a myth that all you need to do is put people on email drip campaigns and setup a website and market it and then you will have all these inbound leads that will come beating down your door and the sales person can just sit back and become an order taker and not really have to do any hard work or even call anyone for that matter. While I love inbound leads, there is a massive untapped market out there that needs to be aggressively courted and hunted. They will never seek you out, the only way you will be able to do business with them is if you reach out to them continually. And the only way you will get the majority of your referrals is if you actually ask for them and cultivate the existing relationships that you’ve built. The sale is not done when the sale is made, that is when it just begins. The true rewards in sales are from long term relationships built on a foundation of trust. And yes you will get some response to your email campaigns. I am not saying you won’t. Another part of the myth is that cold calling is dead. Or that you you can’t cold call anymore. Cold calling is not dead, it’s alive and well and it’s a great way to build a business. Especially if you don’t have a marketing budget and especially if you are not using OPM (Other People’s Money). And if it’s not a toxic limiting belief about prospecting the answer is fear. Fear is the biggest killer of sales out there. What is the quickest way to eliminate fear? If you are prepared prior to the cold call it becomes a lot less cold and a lot less scary. Imagine if I asked to jump off a 20 foot cliff into water and you have no idea how deep the water is. What is the feeling in your gut as you look over the edge? What do you see as you look over the face of the cliff into the murky blue green water below? What do you hear going through your head as you prepare yourself to take the plunge? What do you say to yourself as you look over the edge? Now imagine you’ve just seen all of your best friends jump into the water with no problem and they are having the time of their life playing in the water and they do it over and over again, just relaxing and enjoying the water. What do you see as you look over the face of the cliff into the relaxing and cool waters below? What do you hear as your friends cheer below? Isn’t it a much different experience when you remove fear from the equation? It’s the same with cold calling, if you know details about the company before the call it removes the majority of the fear or eliminates it all together. Cold calling is like a muscle the more you call the more you like it. The more you call the more money you make. The more you call the more confidence you have you can call. The more you call the more confidence you have you will call. The most important tool you have that’s outside of yourself is………….. Survey says, your phone. The phone is the great equalizer. The phone should be the closest thing to you on your desk. In the hunt for new prospects sometimes the monotony of looks for lists of people to pursue is the major challenge that stops sales people from prospecting on their own. One way to make finding prospecting lists highly enjoyable and fun for you, so that you love it and it’s part of your DNA is to pick verticals that you are actually interested in prospecting into. When I was at Amazon.com. At the time I was very interested in being a DJ and I would prospect different DJ equipment manufactures and merchants. The more you focus on prospects you are interested in the more successful you will be at it. No matter what the process is you can make it more enjoyable by scoring the process. What do I mean by scoring? Think of scoring like you are Hans Zimmer, and you have the ability to score the sound track to a movie. What kinds of sounds could you add. Or what kind of visuals could you add, or what kind of feelings ? For me one of the most powerful impacters for me personally is sound. Whenever I’m working on a project that I think could use a better sound track I add music. Having challenges running up hill? Put in the rocky theme. Think of your favorite activities and your favorite music. The act of prospecting is going to feel more enjoyable and more fun. Never forget the importance of prospecting. No matter how far you progress in your career as a sales person never forget the value of a lead or how to create one. Who is more valuable to the marketplace a sales person who can generate and create their own leads and opportunities or a sales person who simply waits for leads to be distributed to them through sales development and marketing? The answer is obviously the sales person who can generate their own pipeline and build out a list of their own prospects. A lot has changed in the sales Industry in recent times. The book Predictable Revenue talks about the virtue of splitting out prospecting to the sales development team, and splitting out closing to the account executives. I believe from a process and management perspective this makes sense especially if you are looking to scale a large sales team. Now if you are a not in sales management and are a sales person and you want to develop an mediocre income and live the life of an average sales rep, don’t do any of your own prospecting. Repeat if you want to live the life of an average sales rep don’t prospect. If you want to make a tremendous income and live an amazing life you must do your own prospecting. In the words of Andy Grove the former CEO of Intel in his book High Output Management, when it comes to management he says to make sure your are delegating not abdicating a task. The truth is sales development will generate leads for an account executive and the truth is these leads are most likely projected to get you exactly to your quota and no more. To absolutely destroy your quota you must have a prospecting system of your own. You must hone your prospecting skills and dedicate time each day to bringing in leads. After all the more leads you have the more opportunities you have. Prospecting must be a habit you cultivate. And this also brings up an interesting point, let’s say you get only 20 leads per month. How likely is it that you will try out new strategies/tactics to try to improve your sales process? The answer is that most people when working a limited amount of leads will stick with their comfort zone and not try new things. If you have unlimited leads to call on it becomes much easier to increase your skill at a higher rate. Imagine you only do one demonstration a day. At the end of the month you’d have about 20 demonstrations that you had completed. Let’s now imagine you did 5 demonstrations in a day on average. You’d be at 20 demos in 4 days. And you would rapidly become a better presenter than the person doing one a day by sheer repetition. Repetition is the mother of skill. The real question is as a sales person is this, how do you build a prospecting systems that works to generate the income you desire? Here are a few different prospecting Tactics that have worked wonders for me over the years, not every single one will be suited for your exact sales situation but they all have value. Remember the more prospecting systems you build the more money you’ll make! This is a prospect hunting tactic has worked well in every account executive role I’ve had. The idea comes from the Tim Ferriss classic the 4 Hour Work Week. 1) Find a list of prospects, they are everywhere look on the internet. To be more specific check out different trade associations or think about where your prospects might hang out and congregate. 2) DO NOT COPY AND PASTE into a spreadsheet yourself. I’ve seen many sales people think their job title includes data entry. 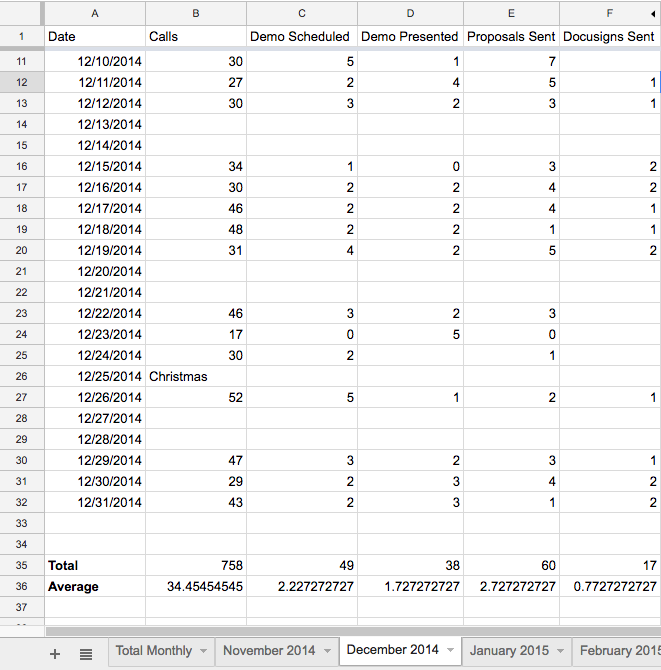 If you spend all your time entering data into a spreadsheet, how are you going to have time to sell? 3) Hire someone / (delegate) the creation of the list to someone else. Check on Upwork.com to find someone to do this for example. if you want to be in sales, part of being a top performer is time management. Should you spend time copying and pasting or paying someone to do this? Pay someone to do this. 4) Upload Data into Salesforce or your CRM of choice. 5) Write a compelling intro email script. 6) Send out the emails to about 200 people per day. If you build a list of 2k I’d really recommend not hitting the entire list at once. 7) The INSTANT you get an email back, call the prospect directly on the phone. The longer you wait to call the more likely you will loose this lead. This is an easy way to maximize the use of your time and build a secondary lead pool that no one else has access to except you. The prospect hunting tactic comes from the Chet Holmes sales masterpiece the Ultimate Sales Machine. Imagine you have an entire stadium that you have filled with you ideal clients. What presentation would you give to them? You must be ready to give this presentation at any time. Read Chet’s book to get the full story. This tactic is better for more complex sales. I’ve used this tactic specifically at marketing agencies. It can also be used at in person events instead of via webinars. In person works even better! 1) Build a prospecting list using steps 1 through 5 from the 4 Hour Work Week method above. 2) Create a piece of education material that adds massive value to your target market. This cannot be a presentation where all you do is attempt to “sell” your clients. It must be an educational piece that provides them with something of value. 4) Have some type of special incentive at the very end of the educational material. A free analysis or special promotional incentive for attending could be different ideas, use your creativity. 5) Continue the educational webinars / seminars and continue adding value. The frequency should be once per week or every other week. If you can’t swing that it must be at least once a month. This tactic works great for longer sales cycles and getting into larger accounts. The core idea is to position yourself as a thought leader and an expert in the field that will add value to the relationship before the relationship exists. This is a great way to pre-frame your clients on what they can expect. This prospect farming tactic takes time. It is well worth the wait as It builds on itself. This works really well when you have committed to staying in a specific industry. If you are a job hopper mercenary… I see you out there… probably best to skip this one. 1) Find lists of businesses who your ideal clients potentially work with. You want to find companies that have their own large book of business and who’s book of business is filled with your ideal type of clients. This could be marketing agencies, IT consultants, payment processors, law firms, anyone that your prospective client potentially would do business with. 2) Create a referral bonus program where you pay a set amount per referral that turns into business. If your company does not already have some form of referral bonus create this on your own or sell the idea to the marketing department. 3) Create a presentation on how specifically you can add value to their book of business that also highlights your referral bonus. 4) Reach out to as many of these potential referral partners as possible. 5) Ensure your referral partners are paid timely and on a regular basis. A few keys to this strategy, let them know it’s a two way street and you will refer business to them as long as it is a good fit and it matches their ideal client profile. Ask them who specifically is their ideal client so you know who to look for and let them know what specifically is your ideal client profile as well. There will be some Marketing Agencies and Consultants who are against receiving a referral bonus because there can be a conflict of interest. Let them know they can be fully transparent with their client and simply credit the client account back the referral bonus in order to maintain their neutrality, this is simply a way that they are able to add value by linking them up with potential partners. I first ran across this idea from an Insurance Salesman named Steven. Thanks Steven where-ever you are! It’s also in the book How To Master The Art of Selling by Tommy Hopkins. Thanks Tommy! This is an old school referral tactic that works spectacularly. It works even better now because most communication is now electronic instead of through the mail. This is why direct mail has had a huge come back in recent years in terms of response rate. 1) Buy thank you cards on Amazon. 2) Buy Starbucks cards or gas cards ( The increment depends on how much a new client is worth to you). Any small gift will do here. 3) Write a hand written thank you note to every single new client you sign up for your product or service. 4) Mail the thank you note with the gift card and five of your business cards. Make sure to ask specifically in the note for the client to refer their friends, family, and business associates. Prior to attending the events develop a quick in person qualification script so that you don’t waste your time with people who are not qualified to do business with you or waste time with people who have no way to refer business to you. 1) Attend as many networking events as you can. 2) Carry business cards with you everywhere. 3) Hand them out to everyone at the event. 5) Let them know about your product or service and referral program. You will be surprised how leads will “magically” come back to you. I’ve had clients I met at an event over a year ago call in and say they are ready to move forward. In person is always the most powerful way to do business, never forget this fact. Typically you have at least 4 legs on a bar stool. If you knock off one of the legs on the bar stool and you now have 3 legs on your bar stool, it may not be very comfortable but it can still stand with some balance while you sit on it. Now what if we knocked off a second leg and you now have 2 legs on your bar stool? It’s going to be tricky but you most likely can get the bar stool to keep standing, if you’re very careful. Now what if we knocked off the another leg. Now you have a bar stool with 1 leg….. it’s not very easy to keep your balance with this bar stool. If you have 1 leg on a bar stool, how sturdy is it going to be? And what if we kick that 1 leg on your bar stool, what happens? You fall to the ground! Now the bar stool is your business and the legs are your different prospecting systems and lead sources. If you rely solely on the sales development team, you have one leg on your bar stool. The mission must be to have as many legs on your bar stool as possible. This way if a lead source drys up you are still standing and stable. The biggest mistake I’ve seen businesses make in the past was solely relying on one lead source, this is very dangerous indeed. I hope you enjoyed this post, please respond in the comments with your success using these systems or any additional systems I left out that you think would help. Thanks for reading, now build a new prospecting system right now! If you asked boxer Cesar Chavez Jr. at any point in time, 10 days before his weigh in, with Canelo Alvarez the EXACT amount he weighs, he’d be able to tell you down to the ounce. This is because both boxers in this specific fight must make weight or they risk a penalty, A $1 MILLION DOLLAR penalty for not making weight. With stakes like this, both boxers knew EXACTLY how much they weigh before they go to the weigh in. Now, if you ask someone who hasn’t worked out in a year and hasn’t weighed themselves daily, and doesn’t have $1 million dollar stakes on the line, how much they weigh, EXACTLY ,to the OUNCE, they might be accurate. The key word there is might. The probability they will exactly right is extremely low. In most cases they will be off in their estimate. In some cases they could be 1 pound off, 10 pounds off, even 30 whole pounds off. And if a bowling ball weighs about 15 pounds, this means they could be carrying around 2 extra bowling balls without knowing it. In other words, their perception of what they weigh and their actual weight will be vastly different. Now you might be saying to yourself: what does this have to do with sales Dan? Knowing where you are at EXACTLY has everything to do with sales and the stakes are easily worth OVER $1 MILLION DOLLARS over the course of your entire career. How many presentations did you schedule today? How many proposals did you build? How many DocuSigns did you send? They say this but they don’t sound certain because they don’t know for sure. They have a general idea but they don’t know EXACTLY. One of the biggest mistake I’ve made in the past was thinking that I was taking more action than I actually was. Without measuring and reviewing sales metrics daily it’s nearly impossible to improve your performance. You want to be aware of your behaviors in order to be able to change and effect them. If you don’t know what you are currently doing now how on earth are you going to improve upon what you are doing? What I’ve found, especially with sales people who are great at making an emotional connection with their clients and have a high level of emotional intelligence, is they may be great at building relationships and connecting with people, but they are severely lacking in their organizational skills. In the past when I was first getting started in sales, I was guilty of this behavior myself. I would forget to enter data into the CRM because I didn’t think it was that important. As long as I hit my number at the end of the month and exceeded my quota, that’s what counts right? It wasn’t until I got obsessed with the numbers that my sales exploded. Sales is all about numbers and that’s one of the things people love and hate about Sales or love to hate about Sales. There are not many careers out there were you can measure exactly how well you are doing any minute or hour of the day. This old axiom from computer science has relevance when it comes to CRM data and being able to measure your performance or make decisions. If you are putting Garbage into the CRM that’s exactly what you get back… Garbage. In other words if the data you input is not accurate or if you neglect to enter the data in the first place, that’s what you get out of the CRM, Garbage. Bad, inaccurate data. I once met a Sales Rep named Damian over a decade ago. And I saw him making tally marks on a piece of paper. And I asked him what he was doing. I adopted this strategy to ensure I never fooled myself regarding my key performance indicators again. How to not fool yourself. The simple tally system helped me when I was really focused on ramping up my personal sales. I would track every single activity. If you asked me the questions I asked you at the beginning of the post, I would know the answer EXACTLY. And I would not track this so that management would be able to see or to input data to make it look like I was doing my job. I would do this so that I would know EXACTLY where I was at any time of the day. With this you can notice trends. When I initially started doing this, I noticed I would make fewer calls on Monday and Fridays and those were the days to attack with more aggressiveness because I was leaving money on the table. I also noticed how much my emotional state would effect my numbers for that day. To paraphrase Peter Drucker a bit, what does not get measured does not get managed. And we rely far to much on CRM data when the reality is that most sales people are not very reliable at data entry. So if you know that you’re not very reliable at entering data into the CRM then this tally system can provide you an insurance policy. Now why go to all this trouble? Why is it valuable to track the specific amount of activity you take? Double the number of leads you receive. Double the amount of activity you take. For this blog post we are going to focus on activity. How much is one phone call worth to you on average? How much is one demo or presentation worth to you on average? What if you knew that one phone call was worth 30 dollars on average or 50 dollars on average, how hard would it be to pick up the phone? What if you knew that one presentation was worth 700 dollars or 1000 dollars? How hard would it be to put yourself in a peak state for the presentation if you knew if you were paying yourself 1000 dollars per hour? Double your activities double your sales. Don’t over complicate things. If you want to double your sales, increase one of the three: activities, leads, or conversion rate. Now what if you don’t know how much a phone call is worth? And what if you don’t know how many phone calls you make per month? And what if you still want to double your sales? You won’t have the same motivation that you do when you know how much an activity is actually worth. You won’t know specifically what number you’d actually need to hit to double the amount of activities and double your sales. Decide how much money you want to earn per year. Write this amount down. This is your income goal. Take the new number (income goal – yearly salary) and divide by 12. Write this amount down, this is the amount you will need to average in commission income per month to hit your income goal. Now take your last commission statement from the prior month. Divide this number by the amount of phone calls you made in the month. This is how much a phone call is currently worth to you. Now take your last commission statement from the prior month. Divide this number by the amount of demos or presentations you made. This is how much a presentation is worth to you. 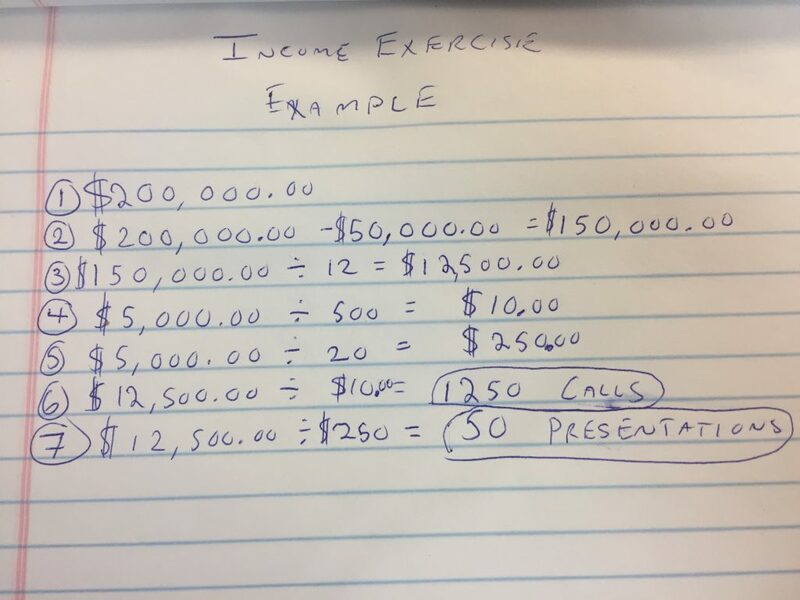 Take the amount you will need to average in commission income per month to hit your income goal and divide this number by how much a phone call is worth to you, this is how many phone calls you would need to make to make your income goal with your current conversion rate. Take the amount you will need to average in commission income per month to hit your income goal and divide this number by how much a presentation is worth to you, this is how many presentations you will need to make to hit your income goal with your current conversion rate. Now that you have an exact call and presentation target to hit, GET AFTER IT! How does it feel to know EXACTLY how much activity you need to take in order to achieve your income goal? I read the book The Secret, and I was aware that it left readers with the false sense that all you had to do to get anything in life was to think about it enough to attract it into your life. Or in other words, a law of attraction. Think about something enough and eventually you will get it. My personal belief is in a law of attraction with action. If you back up your belief and thoughts with MASSIVE ACTION, that’s where the results come from. You must believe and you must act if you want to reach your goals. I’ll let you in on the real secret If you don’t take action you will not get the pleasure of the results. Results belong to few that do take massive action! Now, it’s not just massive action that will get you there. The wrong actions will take you away from your goal, not toward it. In other words the correct behaviors will get you to your goal. And the incorrect behaviors will take you further away. Now realize there is no failure, only feedback. If your behaviors are not getting you results that you want, you’ll simply want to change your approach. until you get the result you are after. When you do a behavior or an action enough times it becomes a habit. A habit simply means that you’ve done a behavior enough times that it’s drilled into your unconscious mind and you no longer have to think about the behavior consciously anymore. As with a behavior there are habits that serve you and habits that do not. With the right habits success is easy. With the wrong habits failure is inevitable. Now this brings up a question: Do you have the habits and behaviors of a top performer? There have been many books written on habits and how to change habits. One I’d recommend specifically is called The Power Of Habit. This is completely false and you like me may have been faked out by these axioms in the past. And another book that I happened to be introduced to at the time was a book called the Brain That Changes Itself, it is a book on neuroplasticity or the ability of the brain to form and reorganize synaptic connections, especially in response to learning or experience. Neuron’s that fire together, wire together was a quote that stuck with me from the Brain that Changes Itself. In other words if you do a behavior enough times you literally rewire your neural network. At this time in my life I had adopted a lot of behaviors that I was not proud of. I was eating unhealthy food and I had gained a lot of weight. At the time I weighed almost 205 pounds. I was feeling like I was getting fat and old and I was only 23! Not only that, I had picked up a bad habit of smoking cigarettes. I knew I was not headed in the right direction. It was a challenging time and I knew I wanted to change. I decided to move out of Seattle to New York City to get out of my environment that I’d been living in and redesign my life from the ground up. Now, reading the books and believing is one thing and this was an integral part of transforming my life and making changes. I also took massive persistent actions and implemented new systems to transform my life. Without these systems, habits, and actions nothing would have changed. There is a feedback loop with beliefs and action. If you take massive action you get results and the results then reinforce your belief and this makes you take even more action and then this reinforces your belief even more and you take even more action. I started going to Muay Thai class and training 5 days a week. I implemented the slow carb diet that Tim was talking about on his blog and I got massive changes in my body. I cut down to 175, I stopped smoking. It was an exciting time and it was rapid change! The change was a result in a belief change. I can change, I will change it, and I must change now! Without massive action, I could believe that change was possible. Without massive action, change wouldn’t happen. It wasn’t until I believed AND took massive action AND installed the successful habits that the true transformation took place. There are a few heuristics or “rules of thumb” that you can follow when it comes to success and creating habits that serve you. It only takes 21 days to create a new habit. If you can hold on for a behavior for that long the new habit will be “installed” into your nervous system. And the longer you reinforce and continue the habit the stronger it becomes. Most people go around believing the majority of their action is fully conscious when in actuality the majority of people are going around on auto pilot and their habits are directing them. Once you install a habit into you unconscious and it’s drilled in there it becomes easy because your unconscious will do the hard work for you . The processes we run on are mainly automated. Think about driving your car. Do you remember how difficult this was to begin with? Now it’s something that you can do without “thinking” about it. One of the biggest dangers I see in Sales, for sales people, is they keep doing the same behaviors over and over again and those behaviors don’t actually work. And then these bad behaviors become bad habits. Getting Enough Sleep to stay sharp. Eating healthy, energy rich foods. Reviewing goals on a regular basis. Anything that effects your emotional state can cost valuable sales. Putting your body in a position where it is ready to perform at a high level means that you will make more sales. Now more specifically lets take a look at sales focused habits. Remember a behavior repeated enough times will become a habit. If you don’t have one of these income increasing habits, I’d recommend trying on the behavior on for 21 days. There are a lot of habits here, I’d try one habit at a time so you don’t overwhelm yourself. plan the call in advance. plan the presentation in advance. plan the week in advance. plan the month in advance. plan how they will hit goal. immediately begin working on their most important task first thing in the morning (Eat that Frog). batch similar tasks together to maximize the leverage they get on their time. show up on time or early to appointments and meetings. work all the time they are at work with 100% their focus. focus on the 20% of tasks that get 80% of the results. (Perato Principle). delegate tasks that are not sales related. consistently manage their emotional state even when the going gets tough. are able to change their state quickly if they get into a negative state. realize that emotional states effect their results. are in positive empowering emotional states the majority of the time. help other people around them to feel positive emotions on a daily basis. help their clients feel positive emotional states on a daily basis. consistently manage their clients emotional states even when there is a challenge. continually review their goals multiple times per day. measure their performance against their goals. celebrate and reinforce themselves when they attain a goal. remember to set the next goal once they’ve attained a goal. listen more than they speak because they understand listening builds rapport. take excellent notes and listen intently because they know what the client is saying provides information on how to help the client. are always looking for new prospects. are not afraid to pick up the phone and cold call. constantly look for new lists and communities of prospects. do not rely on the leads that they are provided by the company. understand that speed is equated to quality in sales and will contact new leads immediately. have lists of the appropriate qualifying questions memorized. remember to ask all of the qualify questions upfront and won’t move on to the next step until a client has been properly qualified. happily point the client in a different direction if they feel that their product would not be a good fit for them. craft their presentations differently depending on who the audience is and follow the axiom “know your audience”. have a logical flow for their presentations. have the presentation prepared in advance. understand that attention is one of the most valuable resources that a person has and frequently check in on the audience to ensure they are engaged throughout the presentation. have lists of every single objection there could be for their product or service. have a variety of ways to overcome every objection and have rehearsed them diligently. view objections as a sign of intense interest on the part of the client. understand an objection is simply a question. look for ways to make every negotiation win / win. practice negotiation in other areas of their life. look for ways to add value in negotiation. don’t view negotiations as binary. presuppose the client is going to buy. ask for the sale with certainty. know many different closing techniques and practice them. understand that closing is natural if you’ve qualified the client, built trust and delivered an excellent presentation. understand that closing the sale really begins the relationship. It’s the beginning, not the end! actually ask for referrals from as many people as possible. use their companies referral program or create one if it does not exist. sell their referral program as much as they sell their product or service. constantly take in new information on how to improve in sales. constantly read new books and take classes that focus on self improvement. spend at least an hour per day learning and growing. stretch themselves to make more calls then the call goal they set for the day. are constantly pushing themselves to get more productivity out of each day. measure every activity they take. reverse engineer their activities to determine how much money each activity they take is work. focus on dollar generating activities. do not do activities that don’t add value. This list is certainly not a complete list. I’d highly encourage you to continually ask yourself the question what are the most useful behaviors or habits of a top performing sales person? What are my current behavior or habits now? If you want to become a top performing sales person, you’ll want to know where you are now and where you want to go. The way to bridge the gap is implement one new success behavior or habit at a time. If you think of other habits that I forgot, feel free to add them to the comments section! Now that you have the identity of a top performer and you have the beliefs of a top performer you also must naturally continually develop and improve the skills of a top performer. Fortunately there are a only a few key skill areas in the art of sales and persuasion that you’ll want to master in order to become a top performer. What stops you from closing more sales? In many cases what is holding you back is one of the key performance areas that relate to selling. No matter what the art, science or area of interest there are always key performance areas. If you measure your skill in each area then you can implement constant and never ending improvement in each area. You can understand anything if you break it down into small enough chunks. It’s the same with the sales process, you can break down the sales process into 8 main chunks that are listed above. 1) Rate your self on a scale of 1 to 10 on each of the key skill areas. 2) Now copy and paste the wheel of sales into a word document and print out the wheel. Take some time to fill in you ratings on the wheel. 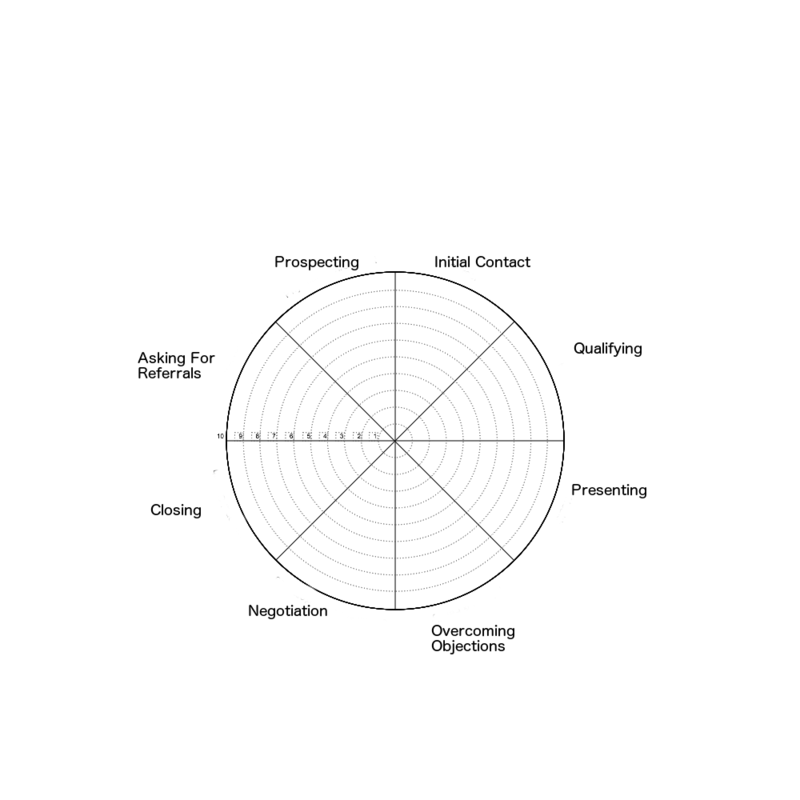 How does your sales wheel look? 3) Now what if you tried to drive your car with this wheel? Your strength or weakness in any of these key performance capability areas will have a major impact on your income, your life, and your development in sales. If you choose to neglect any of these key performance areas you will pay the price by loosing money month in and month out. What this means is you will continue to loose money month after month until you improve the key performance area. What this really means is to be successful you’ll want to increase your skills and capabilities every single day because when you do, success is easy. It’s easy to be successful if you are investing in yourself every single day. This is how you get the edge in sales! Now that you’ve done this exercise you’ve identified one, possibly multiple areas, that you may want to focus on improving over the next month or quarter. I’d highly recommend you focus on improving the weakest area. This weak skill area could be the key to doubling your income this year. I’ll repeat that, the weakest key skill area could be the key to doubling your income this year!! How can you constantly upgrade your capabilities or skills? Brian Tracy has the philosophy of the golden hour. The golden hour is your opportunity to focus on increasing your skills for 1 hour of each day by reading books or listening to audio programs on your field or profession. This habit has been proven time and again to transform your abilities and your income. If you take one thing from this blog I’d recommend it be implementing the golden hour. The key here is the idea of CANI or constant and never-ending improvement. This is a core belief I learned about through Tony Robbins and his study of the work of the management guru Edward Deming. Deming’s work had a great deal of influence in Japanese business circles specifically. And I’ve been greatly influenced by Deming’s work as well. The Japanese have a word constant and never ending improvement that perhaps you’ve heard of it, Kaizen. Kaizen is a belief and a value that will help you skyrocket your skill in any area. And the Golden hour is a specific behavior or habit that you can put into place to achieve Kaizen 365/24/7. How can you learn new skills and techniques rapidly ? I’m a big fan of Tim Ferriss, in his book the 4 Hour Chef he laid out the formula for learning any skill rapidly. Deconstruction – What are the most important blocks? In this case we’ve broken down the entire sales process into 8 chunks. Selection – – What is the 20% of the material that will get you 80% of the result? I’d highly recommend finding someone very good in your weak skill area and asking them what books they would recommend or found valuable in this area. I own all the books on this list for example. Sequencing – What is the most effective order to learn this key skill area? As I mentioned before I’d recommend selecting the weakest area to focus on first. Stakes – What psychological and social mechanisms can you setup for not learning to hold you accountable? A great social mechanism is to tell as many people as you know, what key skill area you are working on and how it’s your goal to improve in this area, they will naturally want to check in and this can provide some added pressure to hold you accountable. Compression – Can I compress the 20% of the material into a one page cheat sheet? These are super helpful, especially if there is something you can have near your desk that reminds you of the 20% that is the most important. Frequency – How often do I need to train to keep this level of skill? If you don’t use it. You lose it. How often do you have to train to not loose the increase in this skill area? Encoding – How do I create mental anchors and tricks to make sure I remember? – The example DiSSC CaFE for remembering this process is an example of a mental trick or an anchor. I hope you enjoyed this exercise on how to increase your sales skills, I’d highly recommend actually DOING the EXERCISE and implementing the golden hour. If you have please share some of your learnings in the comments section below. Now the real question is, how can you implement constant and never-ending improvement or Kaizen into your sales process right now? Are they all serving you? And not only that, why do you believe what you believe? Beliefs are powerful. And beliefs are dangerous. Your beliefs are one of the most important aspects when it comes to selling. If you don’t believe in sales then you can’t sell. If you don’t believe in your product then you can’t sell it. If you don’t believe in your company then you can’t sell it. If you don’t believe you will succeed then you won’t. Now this brings up and excellent question: What is a belief? A belief is a feeling of absolutely certainty about what something means. And the two major kinds of beliefs are General beliefs and Rules beliefs. Humans are great at creating a meaning for everything. The most exciting part about learning about beliefs is we get to determine the meaning. You get to determine what you believe. You cannot control what happens but you can control how you respond to what happens and the meaning that you give to what happens. There are two types of beliefs and there are also two classifications of these two types of beliefs. You either have an empowering belief or a limiting belief. There is always a way and I’ll find it. If I enjoy the process then I’ll be even more effective. If I prepare then there is nothing to fear. I’m too young to be successful. I’m too old to go back to school or learn something new. They are wasting my time. If I work hard I might not get to my goal then why try in the first place? Those are just a few examples of limiting beliefs. And actually they are painful to even write down. Many beliefs are unconscious, not something you consciously think about in your day to day life. Most beliefs are typically running in the background. You can think of a belief almost like an operating system on a computer that all other programs run on top of. If the operating system is old and outdated it’s going to be very challenging the run the latest and greatest programs (happiness, success, fulfillment…). If subconsciously you believe sales is not a good profession, how good of a sales person are you going to become? Now, we know what limiting beliefs are and what empowering beliefs are. And we know that it’s better to have beliefs that serve you instead of beliefs that break you down or prevent you from taking action. I am sure this is leading you to a few questions, how do you know what your limiting beliefs are? How do you eliminate limiting beliefs? How do you create and install new beliefs that empower you? Remember we said a belief is a feeling of absolute certainty about what something means. That means that if you truly had held a limiting belief in the past you would not question it in the slightest or doubt it in any way. The most dangerous thing about a limiting belief is that you may not even be fully aware of the fact that you have had it because it hangs around in the background. A limiting belief can be thought of like a weed in the garden of your mind. Some weeds you may not notice at first, but once you become aware of the fact that you have a weed in your garden you can then pull it out of the garden. Some weeds are easy to pull out, others take more time. Step 1 – Become aware of your limiting beliefs: Take a moment to write down limiting beliefs you’ve had in the past and list three that come to mind. Step 3 – Scramble the limiting belief – Give you self a pat on the back, the simple act of writing these limiting beliefs down takes away the power that they may have had over you in the past. Now you will notice how silly and outdated some of these things truly are. Now ask yourself did I really believe that in the past? Go ahead, ask yourself out-loud? Did I really believe that? Now that it’s written down and it’s out of your subconscious, let’s take a moment to scramble this belief. It’s like a record, if you scratch record or a cd enough times it can never be played again. 1) Repeat your old limiting beliefs in a Donald Duck voice three times. 2) Repeat your old limiting beliefs while plugging your nose and say it in a really strange voice three times. 3) Repeat your old limiting beliefs in a really high pitched voice three times. Step 4 – Pick three new empowering beliefs – The irony is that the empowering belief is usually something that is the exact opposite of the limiting belief you had in the past. Take a moment to write three of these new empowering beliefs down. Make sure that your new empowering beliefs truly resonate with you and make you feel powerful, because you are going to be hearing them a lot in the near future. Step 5 – Install the new belief – This in my opinion is the most important and life changing part of this process, so take it seriously. Anything that is repeated over and over and over again with certainty can easily become a new belief. The key is certainty. The nice thing about an empowering belief is that the more you repeat it, the more powerful it gets. And the more you repeat the empowering belief the more certain you will become. Use the power of the Reticular Activating System to install the new belief. The Reticular Activating System is the part of the brain that controls what our mind determines is important and what we pay attention to. The truth is our brain deletes, distorts, and generalizes the majority of the stimulus going on around us, if it didn’t we would probably go crazy or we simply wouldn’t be able to process the all the different input. Have you every noticed the same exact car that you drive seems to appear everywhere you go? For most people when we see our same car we recognize it immediately and it comes into our “awareness” or what we pay attention to and focus on while the majority of the other cars on the road do not. This is simply because we don’t find them important enough to bring into our awareness or pay attention to. This is the Reticular Activating System at work. 1) Write your top 3 empowering beliefs. 2) Write them in the notes program on your smart phone. 3) Set this note as the background image and the wall paper on your phone. 4) Write down your empowering beliefs on three 3×5 cards. Place one card at work. Carry one with you and have one at home by your bed. 5) Display your empowering beliefs on a poster board in a place you will see them every single day at your home. 6) Extra Credit – Write down your empowering beliefs 3 times each, every single morning. Say your empowering belief every single morning with certainty. 7) Extra Credit – Create a Success Tape – I learned this from Chet Holmes in the book, The Ultimate Sales Machine. He created a success tape. The tape had meditation music with his own voice reading empowering beliefs with certainty. He would listen to this every single night for almost 10 years. I’ve done the same, it’s very easy with todays recording technology and would maybe take you about an hour or two to create. It’s extremely power because your mind will easily accept the belief that you yourself are reading because it’s in your own voice. I did this for about a period of 3 months. The beliefs have stuck with me to this day, even though I did this almost 5 years ago. Now you are aware of the power of beliefs. Make sure you beliefs are empowering you and not holding you back! This is just one of many exercises that you can do with beliefs. A very powerful belief change program is through the Tony Robbins event, Unleash The Power Within. I would highly recommend this program for anyone in sales as it has an excellent belief change component. When you align your purpose, your identity, your beliefs and your values your sales will skyrocket! We talked about the power of identity last week, and an Identity is really just a cluster of different beliefs you have about yourself. Now the real question is what do you truly believe? If you are saying yourself “I am a top performer” When you meet your client you are already the majority of the way there to making the sale. Having the Identity of a top performer will effect your beliefs, values, capabilities, behaviors, and environment. If you change a behavior by and showing up early for work, this does not always mean you are or will become a top performer. If you change your environment by changing jobs to an environment that supports top performing sales people this does not always mean that you are or will become a top performer. Don’t misunderstand. These are all a part of being a top performer but they are not the entirety of being a top performer, they are simply behaviors. Being a top performer is not just a set of beliefs it’s an identity. And Identity is the most powerful force in your unconscious, because that’s who you are at your core. What does it mean to have an identity of a top performer? To ask another question, would would it mean to you if you had the identity of a top performer? Would you be concerned about hitting goal? Would you be concerned about the amount of leads you received? Do you think a top performer has these concerns? What is a hierarchical system? A simple example of a hierarchical system is a company. Imagine if your company switched CEOs and was able to bring on Steve Jobs as the CEO. How would that change you company? In many ways the Identity of the CEO effects the entire company. This is the same way your Identity effects all of your beliefs, values, capabilities, behaviors and environment. The top of the hierarchical system effects everything down the chain. When most people look to make a change, they look at the environment, behaviors or capabilities. For example if you wanted to quit smoking and you changed your behavior you still believed at your core that you are a smoker and that is part of your identity. 9 times out of 10 you will be smoking cigarettes again, unless you change your identity or your beliefs about them. Does that make sense? How do you change your identity? You must believe at your core that you are a top performer. Most people are not aware consciously of the identity they have selected for themselves. This is something that is typically under the realm of the unconscious awareness. You might be thinking: Dan, seriously? I am 100% conscious at all times. My question for you would be, how do you understand language? The majority of the processes we are running are unconscious. It was not until I took control of my subconscious that I became a top performer. Think about it. Imagine you have all the strategies and tactics in the world. What good will that do if you don’t believe it in your gut a top performer is who you are? One of the biggest things that kills sales is our limiting beliefs about sales. There is a lie being perpetuated out there in the world that Sales is not a noble profession, or that it is a lesser profession. If you believe this subconsciously you will never succeed in sales. You will be fighting against yourself and that’s a battle that you will never win. We must be in 100% alignment with out goals so that our Identity, Beliefs, Values, Capabilities, Behaviors and Environment are all in line with our goal. What would life be like if you had the Identity of a top performing sales person? The goal is to incorporate all the Beliefs, Values, Capabilities, Behaviors into your Identity. You don’t have to change who are at your core, you are you. Becoming a top sale person will not change who you are at your core. But you might say, Dan I wanted to read this blog so I can find one tactic that will increase my sales by 100 %. I can give you all the tactics in the world and if you don’t have the psychology to utilize them it’s worthless to even read about them. The mechanics are important don’t get me wrong. At the end of the day you are being influence by your unconscious and the mechanics will only get you so far. The late Jim Rohn once said, reasons come first answers come second. Now my question for you is, why do you want to become a top performer? Would you like to have a higher quality of life? Would you like to provide more than enough for your family? Would you like to make more calls and generate more sales? Would you like to be happy and healthy? My hallucination is you’ve answered YES to these questions. I know I did when I was writing them. We all want to same things. The real question is If we all want the same things then why don’t we have them? An even better question would be: Why do you want these things in the first place? If it’s just a dollar amount, a number in an online account, is that going to be enough to keep you going when times get tough? What if it’s the last week of your month or quarter and your sick and tired and you feel like you can’t keep going and you want to give up? Are you going to push through the difficulty? What is going to pull you through this? The more reasons you have the easier it is to sell. The more purpose you have the easier it is to sell. The more passion you have the easier it is to sell. The more desire you have the easier it is to sell. It will all change for you when you clearly define the reasons. It will all change for you when you clearly define the why. It all changed for me when I clearly defined the reasons. I had to write them all down and review them every single day. Every day, Dan? Yes, every single day, sometimes two or three times per day. The reason I say this is because successful people do what failures will not do. Successful people take control of their reasons. Successful people take control of their psychology. Successful people take control of who they are. Success is easy. It’s easy to be successful. If you have enough reasons driving then you will become unstoppable. In my spare time I run ultra marathons. I say this not to impress you but to impress upon you how important taking ahold of your psychology is. Do you start out running a 50 or 100 miler when you first start running? No. You start with a 5 k. You move up to a 10k. Then you move onto a half marathon. And you keep going from there. And even before that, when you were a baby, were you sprinting immediately when you were born? It’s the same thing in sales. You grow and progress and you do it methodically, Step by step. Day by day. You get better and better. I was running a 50k in Mendocino, CA. It was the first 50k ever in Mendocino CA. I’d ran a 50 miler in AZ a few weeks prior and was not feeling in any mood to push my luck on this race. Mendocino is beautiful, you have the California Coast with sea cliffs and the Redwoods. The backdrop here is stunning. In the later stages of the race we ran by a hidden waterfall nestled in the redwoods. Followed by a steep climb that seemed to never end. I had the great fortune of having someone to run with up the steep climb. This is one of the surreal experiences of running an ultra is the random conversations you end up having with fellow racers. I don’t recall the name of the person I was speaking to but I uncovered through the conversation that he’d run over 20 hundred milers and had be running ultras for over 10 years. In all the years of ultras, what was the key take away or belief that allowed him to preserver and continue on even when there were challenges and roadblocks? It’s mind over matter, if you don’t mind it doesn’t matter. Now what are your reasons that drive you? And how can you use them when the going gets tough to drive you?